MADELYNN MALLOY and Bob Morin, a homeless couple frustrated by the lack of affordable housing in rural Franklin County, rolled out their blankets this summer on Greenfield Town Common and slept under the stars. Word spread quickly and soon other homeless people around the area joined them. By mid-summer, brightly colored nylon tents all but covered the small grassy strip of land, transforming it into a settlement for 20 homeless people. The encampment soon divided the town, eliciting the compassion of some residents and businesses and the ire of others who saw it as a takeover of the downtown, repelling residents and potential customers at retail outlets. By summer’s end, Greenfield officials had had enough. Citing a litany of public health concerns from bed bugs to public defecation, the Town Council passed regulations allowing officials to disband the encampment. The incident in Greenfield underscored how homelessness is not just a problem confined to major urban centers, but an issue confronting smaller communities across the western part of Massachusetts. 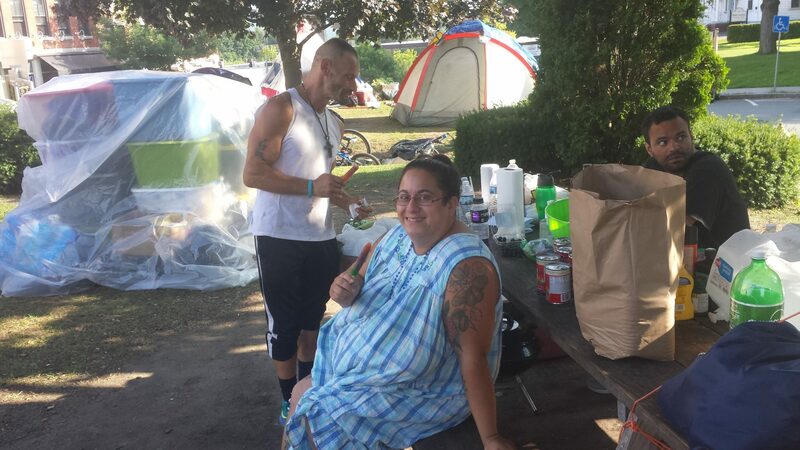 Along with Greenfield, a city of about 17,000 north of Springfield, Holyoke, Pittsfield, Amherst, and Northampton have all been grappling with problems related to a chronic homeless population, including increased panhandling, squatting in abandoned buildings, and “tent cities” in public areas. Jay Sacchetti, vice president of housing and services at ServiceNet, which provides homeless services in western Massachusetts, said waiting lists for the shelters he manages in Pittsfield, Greenfield, and Northampton have ballooned in recent years. “We used to have 5-10 people on the list, now it’s more like 30-50 people,” he said. M.J. Adams, the administrator of community development in Greenfield, has been trying to address the problems raised by the tent city on the town common. Working with local social service agencies, she is trying to amp up the town’s ability to respond to the growing homeless population. The shelter that Sacchetti oversees in Greenfield will be renovated to house additional people during the winter months. The town has also partnered with Clinical Support Options, which operates homeless programs in several towns, to develop for chronically homeless adults 8 to 12 single rooms with shared common areas, kitchens, and bathrooms. Adams is exploring Housing First, a model for ending homelessness that sounds an awful lot like Malloy’s endgame: get people quickly into permanent apartments and provide supportive services to help them stay there. The idea behind the approach is that if a person’s basic needs for shelter and food are met, it’s easier for them to address other issues, such as substance abuse and mental health. It sounds simple, but experts say it’s not. “It takes a lot of commitment and work to figure out who these people are and how agencies can collaborate to meet their needs,” said Gerry McCafferty, the housing director in Springfield who has become a guru of sorts for smaller communities such as Greenfield, Holyoke, and Amherst that are interested in pursuing Housing First. Springfield had its own tent city about 10 years ago. Like Greenfield, the crisis forced officials to act, McCafferty said. “That’s the time we started getting serious about implementing Housing First,” she said. Housing First is a model that was originally implemented in the late 1980s and early 1990s in larger cities such as Los Angeles, Salt Lake City, and New York City. A number of studies since that time show the approach has been effective in getting hard-to-house populations into housing and keeping them there. The one-year retention rate for participants with psychiatric disabilities varied between 75 to 98 percent, depending on how long subsidies and services were continued. McCafferty said the key to Housing First is to lower the barriers to housing. For example, she said, there is often pushback against prioritizing people with serious problems and challenging behavior over those who have been quietly waiting for subsidized housing, sometimes for years. In Northampton, where McCafferty lives, a lot of money has been invested in the construction of affordable housing units, but sobriety is required of anyone moving in. “That’s not Housing First,” McAfferty said.